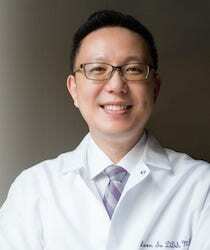 Dr. Leon Su was born in Taiwan and grew up in Orange County, California. He obtained his undergraduate degree from the University of California, Berkeley and then worked as a software and hardware engineer. He went on to receive his Doctor of Dental Surgery (DDS) from New York University, where he graduated amongst the top of his class, and was inducted into the Omicron Kappa Upsilon National Dental Honor Society. He was also heavily involved in Oral-Facial pain research funded by the National Institute of Health (NIH). After his postgraduate specialty training in Orthodontics at Rutgers University, Dr. Su went through the rigorous process to become a Board Certified Orthodontist (only one third of Orthodontists in the United States are board-certified). He is an active member of the American Board of Orthodontists, American Association of Orthodontists, and the Middle Atlantic Society of Orthodontists. In 2018 Dr. Su had the distinct honor to be elected as one of the Top Dentists of America by his peers.